Poetry in Potato Bags project coordinator Leanne Ellul tells us about her research trip to Leeuwarden, the other city hosting the European Capital of Culture in 2018 in the Netherlands, for the poetry/potato hybrid project. Poetry in Potato Bags is a Valletta 2018 and Leeuwarden 2018 collaborative project, led by Inizjamed. The project sees poetry being exchanged between the cities as part of the run up to 2018. Poems are written in Maltese, English, Dutch and Frisian (the language of Friesland, the region in the Netherlands in which Leeuwarden is located). Froukje De Jong is the mind behind the “Poetry in Potato Bags” project, a project that exchanges poetry along with the agricultural produce, and the Frisian whom I’ve met twice in a month. Back in Malta we met at the Agrarian Potato Festival in Qrendi, and then in Leeuwarden between the 22nd and 25th of June. Rita gave valuable contribution to the whole project, not only through writing but also by delivering poetry workshops and sharing her experiences of growing up in a rural environment. As soon as we arrived we were greeted by Jelle Burggraaff, a member of the Leeuwarden 2018 team who is responsible for European connections. At the office we also met Patricia Klomp who works at the information centre, and together they explained the ongoing projects by Leeuwarden 2018. Then, we went to the Post-Plaza hotel which was formerly a post office, hence its name. This place is flawlessly alluring, with details hinting at the former post office without being invasive. Poetry in Potato Bags Project Manager Froukje De Jong with poems from the project – in four languages. The next morning, Froukje took us for a long ride and we also visited her farm. The smell of the soil, the pitter-patter of the rain, and the sound of squelching in the mud, were a true seduction to the senses. From there we headed to school. Yes, we went back to school, older than ever … and a tad naughtier too. In this school, as is with other schools in the region, children learn a number of languages, namely Dutch, English, German, and Frisian. Rita and Dutch poet Hein Jaap Hilarides led a workshop that explored the concept of rhythm and the art of translation (ps. flipping a dictionary comes as second nature to them). The boat ride was up next and there we met other project members, amongst others Loet Hin who is part of the Bildtse Aardappelweken. In the evening we went to Tresoar, the Frisian documentation archive. At Tresoar – a word we can understand without much struggle, we partook in a literary evening made possible by Brian Buhagiar, the Language Officer at the European Commission Representation in Malta. For the first six months of the year, Netherlands hosted the Presidency for the European Union, and thus, from a linguistic point of view, a literary evening to complement such an honour deemed fit. Rita read in English and Maltese. I also delivered a presentation about Inizjamed and the Malta Mediterranean Literature Festival. During the evening a number of Frisian authors read their work and Rita’s work in Frisian and we were utterly engaged by the way Frisians read. During our stay we had a number of interesting interviews because they addressed crucial questions unlike the predictable “Is Malta sunny?” question. We were then invited over by the Fryske Akademy, which is responsible for the upkeeping of the Frisian dictionary. We also met Janneke Spoelstra who was responsible for proof reading the last couple of volumes. Another beautiful space is the decorated room in the ‘Dutch’ Louis XIV style, with remarkable paintings and intricate wood engravings. 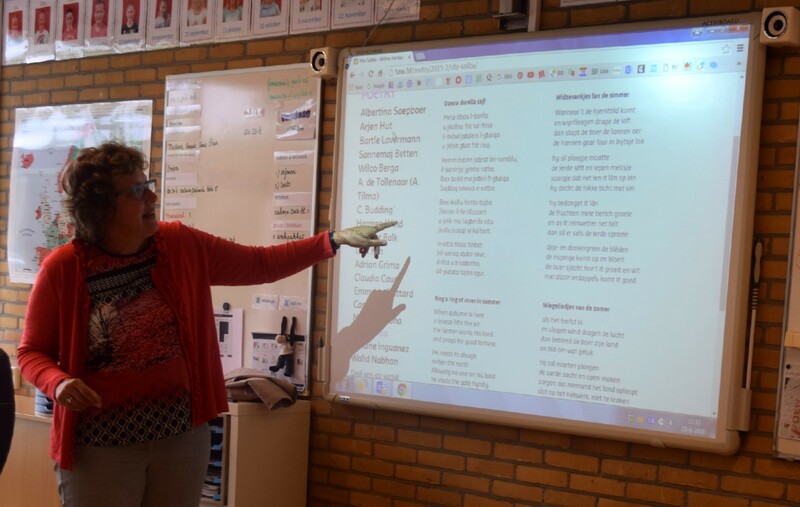 From there we went back to Tresoar where we had an introduction to Frisian literature, to poetry and multilingualism in schools, and to the work done by the Fryske Akademy on multilingualism. The room we met at is a treasure in itself. It is dedicated to Gysbert Japix, whom the special prize of Literature is dedicated to. It is awarded every other year, alternating between poetry and prose. The winners of the prize have their portrait painted and hung to its walls, and as Froukje explained, this is a positive experience for both the authors and the visual artists. Even though we eat at different times of the day and we aren’t as tall as the Frisians are, we have a lot in common. For instance, the Frisian language is spoken by many but few know how to spell it well. Does this remind you of another mother tongue? Even the question that addresses how we should write English loan words was debated a lot in Friesland (ps. after speaking to people from the Netherlands it seems that the Maltese word “Nederlaniż” is in fact necessary). Hein Jaap Hilarides (left) and Rita Saliba (right) in Leeuwarden. Leeuwarden gave me a bagful to ponder on. It was surely a feast to the senses … from the chirping of the birds, to the words I couldn’t fathom, to the jagged roads beneath my feet. No building boasts too much of itself. Take a church, turn it into an office and you have the Fryske Akademy, take the old post office and Gratama bank, turn it into a hotel and you have the Post-Plaza, take the old Blokhuispoort prison, turn it into a cultural centre and you have the cultural hub of Leeuwarden. There is no room left to waste, no space used unwisely. They hold on to the present whilst nodding to their past in the most effective way.